6th Grade completed their 12 class Keyboarding Boot Camp with a class average typing speed of 28.5 WPM and an average speed increase of 21%. All but two of the students increased their typing speed during the 12 class session. Touch typing using correct technique is a skill that will be useful not only during Middle School but will be invaluable in High School and beyond. I would encourage your children to practice their keyboarding skills over the summer. Check the Summer Ideas page for links to keyboarding sites but practice does not have to be actual keyboarding sites. Keyboarding skills can improve while IMing or playing games online or emailing, etc. as long as the correct technique is used each and every time any typing is done. Take some time to watch your child as they type and encourage them to properly position their hands and to use the correct fingers for typing. It’s much easier to learn to do this correctly then to have to unlearn bad habits. For Earth Day, 6th Grade watched and then discussed the presentation, The Story of Stuff with Annie Leonard. As a follow-up to this presentation, each student created original artwork and then created a ribbon piece on the PlanetFesto ribbon to celebrate the reasons they love the earth and to commit to doing something to help perserve the earth. 6th Grade also spent some time correcting errors in three poems about Spell Checkers. Often we all rely too much on the spell check feature in Microsoft Word and these poems point out that this tool will not catch every error you make in something you write. Try these yourself? Can you find all the errors? 6th Grade also wrapped up the A Room With a View Project with pictures and reflections added for April and May. Each student took a picture around the campus in May and posted that to the timeline on the project. Have your child show you which picture they took! 6th Grade also completed How To Survive Middle School brochures for 5th Grade using Microsoft Word. These were allowed to be humorous or serious but were supposed to be truthful and not derogatory to the teachers or the 6th Graders. Each student printed two copies of their brochure – one that they kept and one that was given to one of the 5th Graders. The students seemed to enjoy making these however I believe the point of helping the 5th Graders may have gotten lost. I hope that when school starts that this class truly does help the new 6th Grade class to survive and thrive in Middle School. The final task for 6th Grade was to fill out a survey about the projects and activities they completed this year during computer class. As you can see the brochure project was the most favorite project this year. For your Information, ARWAV is the A Room With a View Project. 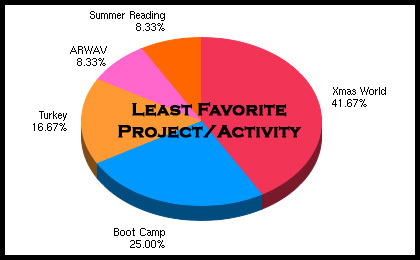 Christmas Around the World followed by the 12 class Keyboarding Boot Camp were the least favorites this year, however, more students felt that the Keyboarding Boot Camp was the most useful project or activity they did this year than disliked it. I look forward to next year in the Computer Lab where we will continue to improve our typing speeds, learn more about Microsoft Office and participate in more collaborative projects. 6th Grade completed their Christmas Around The World presentations and has shared them online. Just as movies are awarded Academy Awards, 6th Grade voted and awarded the best of their Christmas Around The World Presentations. FreeTypingGame.net – This site has lessons, games & speed tests. We often use this site in class to test speed. NimbleFingers – This site has online typing tests and a typing program you can download called Word Wacker. This is a free to try program. E-Learning For Kids – May be a little young for most middle schoolers but it is a fun animated course. Wow, it’s February already and here’s what we did in the lab during January! KINDERGARTEN: Kindergarten worked on learning more letters on the keyboard focusing on the letters “E” through “G” this month. Kindergarten once again concentrated on all things winter and the Winter Wonderland Project. The students watched some of the videos created by other schools involved with this project and they had fun seeing the pictures and singing along to the songs. For their contributions to the project this month, each Kindergarten student created a Penguin Glyph and completed a Penguin Math Book. You can see the finished projects on Kindergarten’s Winter Wonderland page. The book My Brother Loved Snowflakes was read to Kindergarten and they are currently creating their own snowflakes using KidPix in tribute to Wilson Bentley. 1ST GRADE: 1st Grade also spent most of their time this month working on winter things for the Winter Wonderland Project. The students watched some of the videos created by other schools involved with this project and dictated comments to be left for the other schools which were posted on the project wiki. For their contributions to the project this month, each 1st Grade student created a Penguin Glyph and completed a Penguin Math Book. These will be added to 1st Grade’s Winter Wonderland page very soon. 1st Grade also enjoyed the book My Brother Loved Snowflakes and drew their very own snowflakes in KidPix. In addition to the winter projects, 1st Grade also continued to work on their Adventures in Keyboaring completing letters “E” throught “G” this month. 2ND GRADE: The Winter Wonderland Project was also the focus for 2nd Grade this month. They started off the month by reading the Lookybook Penguins Everywhere. Then, they too completed Penguin Glyphs. In addition to just creating the glyph according to the directions, 2nd Grade learned how to rotate items in PowerPoint and to add clipart to their completed glyph. Each 2nd grader was assigned a type of penguin and had to find out how tall the penguin is, how much they weigh and what they eat and add this information to their glyph. You can see the completed glyphs and penguin information on 2nd Grade’s Winter Wonderland page. 2nd Grade is finishing up the Penguin Math Books this coming week and those will be shared once they are complete. 3RD GRADE: 3rd Grade also watched and commented on videos done by other schools in the Winter Wonderland Project and completed Penguin Glyphs. 3rd Grade also reviewed how to rotate items in PowerPoint and how to add clipart to their completed glyph. Each 3rd grader also included information about their assigned type of penguin on their glyph. This will be shared on 3rd Grade’s Winter Wonderland page very soon. 3rd Grade has also joined another collaborative project, The Monster Project. As an introduction to this project, 3rd Grade watched a video about adjectives and listened to the book, Many Luscious Lollipops. After reviewing what an adjective is, 3rd grade then created an Adjective Web about their favorite food. 4TH GRADE: 4th Grade began the new year by checking out who had taken their Christmas Tongue Twister challenges and then they listened to and commented on the December Voices of the World projects from the other schools. St. Martin’s was in charge of the January Voices of the World project and we had fun making our video of the song Make New Friends. You can check it out on our Voices of the World page. We can’t wait to see what the other schools do with this. Since January was a short month due to the winter break some of the schools are still working on this. 4th Grade isn’t involved with the Winter Wonderland Project since this is a K-3 project but they did spend some time working on projects inspired by this project. Wilson Bentley was introduced to 4th Grade through the book Snowflake Bentley. After this was read, 4th Grade used a template in PowerPoint to create a timeline of Bentley’s life and decorated it with appropriate clip art. 4th Grade then used PhotoFiltre to digitally alter Wilson Bentley’s snowflake images in the style of Rick Doble. The cinquain style of poetry was then reviewed and 4th grade created a slide in PowerPoint which contained their snowflake image(s) and a cinquain poem that they wrote about snow or winter or Wilson Bentley. They learned how to record in PowerPoint and they recorded themselves reciting their poem. A show of all of their snowflakes and poems will be coming soon. 5TH GRADE: Ask your 5th Grader about GMT or UTC and they should know what those are and be able to tell you the difference between California time and GMT. This month in computers was all about time for 5th Grade as they began working on the Time Zone Experiences project. 5th Grade started out the month with an introduction to the project and to Greenwich Mean Time. They were also introduced to how to edit a wiki and what a “wiki war” is. After taking a short quiz about time and a survey about when they go to bed and wake up, each 5th Grade student was assigned a Greenwich Mean Time. They have been working on editing our wiki to add information about what time that is in California time and what St. Martin’s 5th Graders would normally be doing at that time of day. They are also using KidPix to draw a picture about what would normally be happening at that time and are adding that to their page on the wiki too. You can watch our progress on our Time Zone Experiences page. Once they have finished their pages on our wiki, they will be updating the Time Zone Experiences project with their information too. 6TH GRADE: Just before the Christmas break, 6th Grade began working on a research project about Christmas Around The World. Each student was assigned a country and had to make an outline in Microsoft Word about what Christmas is like in that country. They then created a PowerPoint presentation from their outline and used that information to create visual slides about Christmas in their country. Once their slides were complete, they narrated each slide. After their presentation was complete, they uploaded it to St. Martin’s account at Slideboom and then added their Slideboom presentation to our Christmas Around The World page. 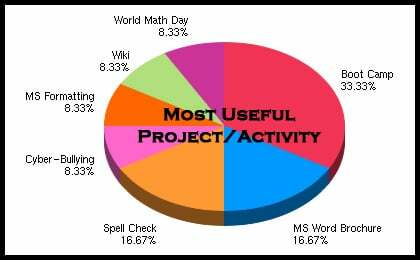 This project meant learning a lot of new skills and reviewing some previously learned: Outlining in Word, Creating a PowerPoint presentation from a Word outline, Recording narration on a slide, Making a sound play automatically on a slide, Transitioning slides, Uploading to Slideboom, Editing a Wiki. There a still a few students that haven’t quite finished but most of the completed presentations are available on our Christmas Around The World page. In addition to this project, 6th Grade also worked on their January Reflections for the A Room With a View project and reviewed some of the other school’s pictures and comments in this project. 7TH GRADE: 7th Grade spent the first week of the month completing their Human Genetics Final Reports an Cyber Bullying Glogs if those were not done. On Inauguration Day, 7th Grade watched a Dateline NBC video called Hope, Change & Symbolism and discussed how far the country has come. They also discussed what they thought the themes of President Obama’s Inauguration Speech was. The format of a formal letter was reviewed and then each student wrote a letter to the President. These have been mailed for any student that wanted their letter sent to the President. 7th Grade ended the month working on a project inspired by the Winter Wonderland Project. The book Snowflake Bentley was read to introduce 7th Grade to Wilson Bentley and then 7th Grade used Excel to create an illustrated timeline of Wilson Bentley’s life. After the timeline was complete, they then used PhotoFiltre to digitally alter Wilson Bentley’s snowflake images in the style of Rick Doble. Two styles of poetry were reviewed, cinquain and haiku, after which 7th Grade created a slide in PowerPoint which contained their snowflake image(s) and a poem that they wrote about snow or winter or Wilson Bentley. They learned how to record in PowerPoint and they recorded themselves reciting their poem. A show of all of their snowflakes and poems will be coming soon. 8TH GRADE: On Inauguration Day, 8th Grade also watched the Dateline NBC video called Hope, Change & Symbolism and discussed how far the country has come and what they thought the themes of President Obama’s Inauguration Speech was. The format of a formal letter was reviewed and then each student wrote a letter to the President. These have been mailed for any student that wanted their letter sent to the President. The rest of the month has been spent writing scripts for the first Social Studies podcast. The segments of this are currently being recorded and will be shared very soon. Wow, December was a busy month at St. Martin’s and not just in the Computer Lab!! I hope that all of you have had a wonderful Christmas. First, I’d like to share with you an online holiday card that I created for a collaborative project that Kindergarten through 3rd Grade are currently doing. All of the Kindergarten & 1st Grade students drew nativity pictures in KidPix and I used this to create our Holiday Card. You can see our card and a card created by another school in the project on the Winter Wonderland Holiday Cards page. And now, here’s a recap of what happened in the Computer Lab during December and a whole lot of projects for you to take a look at. Kindergarten through 3rd Grade focused on the Winter Wonderland project during December. This is an online project for grades K-3 that includes winter-themed technology activities for December, January & February. Kindergarten-3rd Grade will be doing at least some of these activities during these months and reviewing the activities done by other schools. KINDERGARTEN: Kindergarten worked on learning more letters on the keyboard focusing on the letters “C” and “D” this month. KidPix was put to good use drawing both Winter Wonderland pictures and Nativity pictures. The Winter Wonderland pictures were made into a video which also includes Kindergarten singing “Jingle Bells”. The Nativity pictures were used in our online Holiday Card and Kindergarten signed some real cards that we sent to a few of the participating schools in the Winter Wonderland project. Kindergarten also took holiday polls as part of the Winter Wonderland project and we graphed the results in Excel. And when we were all done with that, Kindergarten played some fun Christmas games on the Internet. Check out Kindergarten’s Winter Wonderland page to see their video and the results of our polls. 1ST GRADE: 1st Grade worked on keyboarding focusing on the letters “C” and “D”. We will be continuing this each week for most of the rest of the school year and will have a mini-alphabet book when we’re done. 1st Grade took the Holiday Polls for the Winter Wonderland project and created a Winter Wonderland video with pictures they drew in KidPix and a recording of them singing “Jingle Bells”. 1st Grade also drew Nativity pictures for our online Holiday Card and signed some real cards that we sent to a few of the participating schools in the Winter Wonderland project. Check out 1st Grade’s Winter Wonderland page to see their video and the results of our polls. 1st Grade even had some time just before Christmas to play some fun Christmas Games online. I’ve also posted 1st Grade’s Hand Turkeys that they created in November on our Travel Scrapbook so check those out when you get a chance. 2ND GRADE: 2nd Grade spent December focused on Winter Wonderland projects. First, they took the Holiday Polls for the Winter Wonderland project. They did this by filling out a form online on the Winter Wonderland wiki and submitting their answers. If you want to see the results of these polls for all the schools in the project, you can go to Winter Wonderland Holiday Polls and have a look. Then 2nd Grade drew pictures of what Winter Wonderland looks like to them and they sang “Jingle Bells” and were recorded during a computer class. Their pictures and their singing were combined to make a video. 2nd Grade wasn’t done with Winter Wonderland yet though. They also created Gingerbread Houses in Excel by coloring cells based on a template and then adding clipart to decorate their houses. You can see 2nd Grade’s video and their Gingerbread Houses on their Winter Wonderland page. I have also posted 2nd Grade’s Pumpkin Math Books and their November projects on their Online Autumn page – make sure you check these out too! 3RD GRADE: 3rd Grade completed Winter Wonderland activities during December. First, they took the Holiday Polls for the Winter Wonderland project. They did this by filling out a form online on the Winter Wonderland wiki and submitting their answers. If you want to see the results of these polls for all the schools in the project, you can go to Winter Wonderland Holiday Polls and have a look. When the polls were done, 3rd Grade drew pictures of what Winter Wonderland looks like to them and they sang “Jingle Bells” and were recorded during a computer class. Their pictures and their singing were combined to make a video. 3rd Grade also created Gingerbread Houses in Excel by coloring cells based on a template and then adding clipart to decorate their houses. When they completed their Gingerbread Houses, they were able to play some Gingerbread or Christmas Games. You can see 3rd Grade’s Winter Wonderland video and their Gingerbread Houses on their Winter Wonderland page. 3rd Grade’s “What I Am Thankful For” and “Turkey Glyph” projects are also now available on our Travel Scrapbook – check them out! 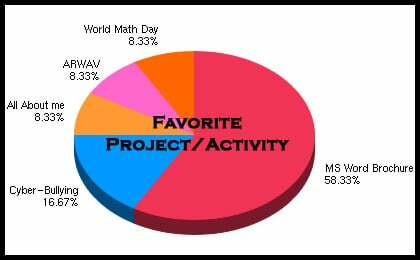 4TH GRADE: 4th Grade completed the December activity for their online project, Voices of the World. You can see this on their Voices of the World page and check out all of the other voices on the Voices of the World wiki. Do you know how to say Peace, Love, Hope and Joy in other languages? You can find out at Voices of the World! 4th Grade has also started working on their keyboarding skills using Sponge Bob Typing. 4th Grade’s Christmas project was a fun one. They selected a Christmas Tongue Twister and illustrated it and then added it to our Tongue Twister VoiceThread where they said the Tongue Twister and then challenged others to say it too. Students from a school in New Jersey have taken their challenges and you can hear them on the VoiceThread too! Can you meet the challenge? Set up a VoiceThread account (it’s free) and try it! 4th Grade’s Internet Safety Posters and their Persuasive Turkeys have been added to our Travel Scrapbook. Make sure you take some time to look at these too. 5TH GRADE: 5th Grade spent some time keyboarding in Mavis Beacon this month and they did a fun Christmas Typing activity. They were challenged to type the lyrics to a song using Microsoft as they listened to the song. Try this – it’s harder than you think. Once they were done with the lyrics, they had to add at least one clip art picture to decorate their lyrics. 5th Grade also completed a spreadsheet in Excel in order to figure out how many presents were received in total for the 12 Days of Christmas. Do you know? Ask your 5th Grader! 5th Grade’s Internet Safety Posters and their Persuasive Turkeys have been added to our Travel Scrapbook – check them out. We will be starting an online collaborative project in January and this requires that each 5th Grader return a signed Wiki Warranty. If you have not seen and signed this, please download it from here, discuss it with your 5th Grader and sign and return it to school. 6TH GRADE: 6th Grade completed their reflections for December and posted them to the discussions tab on their A Room With A View page. Head over to the page to check out the photos so far and read the reflections by clicking on the Discussions tab and then on each month. 6th Grade also tried the lyrics typing. I bet they can still sing the chorus to the song! 6th Grade has started a Christmas Around The World project that we will finish when they get back in January. Each student is researching how Christmas is celebrated in a different country and is creating a PowerPoint presentation about it. They are learning how to use the Outline feature in Word to take their notes and then transfer that to a PowerPoint presentation. 6th Grade’s Cyber-Bullying Comics and their Persuasive Turkeys have been added to our Travel Scrapbook. Take a look! 7TH GRADE: 7th Grade continued to finish up their Cyber-bullying Glogs and analyzed the final results for the Human Genetics project. We will be finishing these up when we return from the Christmas break. 7th Grade also tried the type the lyrics activity. Ask them to sing you the chorus to the song! As their main Christmas activity, each 7th Grader was told that they won a shopping spree to one online store. They had to create a spreadsheet in Excel that would keep track of what they bought and keep a running total of what they spent including sales tax. The catch was they had to spend between $995 and $1000 including tax. They had fun shopping and most of them managed to spend within that $5 range. A few students figured out that some stores have loss-leader products that sell for nothing or almost nothing so they used these to hit the magic $1000 even total. Check out the Travel Scrapbook for 7th Grade’s Cyber-Bullying Glogs and their Persuasive Turkeys. 8TH GRADE: Did your 8th Grader come home singing some Christmas song you had never heard? That’s because they spent a class typing the lyrics as they listened. It’s much harder than you think but there were a few students who got almost all the lyrics correct! 8th Grade also went on a Shopping Spree this month – okay not a real one but they did get to window shop. Before they could shop, each student had to create a spreadsheet in Excel that would keep track of what they bought and keep a running total of what they spent including sales tax. Then they could go and shop but the catch was they had to spend between $995 and $1000 including tax. They had fun shopping and most of them managed to spend within that $5 range. A few students figured out that some stores have loss-leader products that sell for nothing or almost nothing so they used these to hit the magic $1000 even total. Check out the Travel Scrapbook for 8th Grade’s Cyber-Bullying PSAs and their Persuasive Turkeys. KINDERGARTEN: Kindergarten reviewed the parts of the computer by singing Our Computer Song and they visited some age appropriate web sites: Peep & the Big World and Poisson Rouge. Kindergarten also began their introduction to keyboarding by meeting our mascot A Silly Dancing Frog, Giggles and using the web site Key Seeker along with green & purple stickers on their hand to begin to find letters on the keyboard using two hands. They also started working on their Adventures in Keyboarding project in PowerPoint. Each week in class they will be typing words that begin with a specific letter of the alphabet. This week they typed A words. After they finished their typing, they visited Caillou’s Magic Keyboard. 1ST GRADE: 1st Grade was reintroduced to A Silly Dancing Frog, Giggles and Harry (the) Jazzy Koala (with a) Little Semi and visited the web site Key Seeker to reinforce typing with two hands. They then completed the A page of their Adventures in Keyboarding project. Like Kindergarten, 1st Grade will also be completing one letter a week as their typing practice. In addition to typing, 1st Grade also used the educational software program, Jumpstart 1st Grade. 2ND GRADE: 2nd Grade only had computers once this week and concentrated on keyboarding with a re-introduction toe Giggles and Harry to help learn the keys on the homerow. They then completed Stage 1 on the Dance Mat web site. 2nd Grade will be using this site as their primary keyboarding site this year. 3RD GRADE: 3rd Grade only had computers once this week and some of them were still working on their Plant Life Cycle projects in KidPix. Many of the students are done so they went to Tutpup and played math or spelling games against one another or other students around the world. 4TH GRADE: 4th Grade only had computers once this week and reviewed and discussed their Cyber Safety quizzes and Cyber Safety issues. 5TH GRADE: 5th Grade reviewed and discussed their Cyber Safety quizzes and Cyber Safety issues. They also worked on completing their Cyber Safety posters in PowerPoint and All About Me projects in KidPix. These are complete and will be shared soon. Once they were done they played some Internet Safety games and during the last 15 minutes of class they went to Tutpup and played math or spelling games against one another or other students around the world. 6TH GRADE: 6th Grade only had computers once this week and they worked on finishing up their Cyber Bullying Comics in Microsoft Word and writing their November Reflections for our A Room With A View project. 7TH GRADE: 7th Grade completed their Electoral Votes spreadsheets in Microsoft Excel for St. Martin’s voting and reported their results. They then worked on their Cyber Bullying Glogs. 8TH GRADE: 8th Grade completed their Electoral Votes spreadsheets for St. Martin’s voting and reported their results. They then worked on their Cyber Bullying Animoto videos. There were some problems with our blog host and I wasn’t able to update the blog for a couple of weeks. The issues seem to be resolved so hopefully there won’t be problems in the future. 1ST GRADE: Week 6 was Internet Safety Week for 1st Grade. They were re-introduced to the characters at NetSmartzKids.org through the activities at Clicky’s Web World and were all awarded a Clicky’s Web World Certificate. Did this make it home for you to see? During Week 7, 1st Grade was introduced to their on-line collaborative project called How Tall is a First Grader. They were shown an interactive map of where some of the other schools participating are located. They then watched a short video clip from a show called Math is Everywhere and read an online book called Measuring at the Dog Show and then they played some online measuring games. Week 8 brought a seasonal activity and the creation of Pumpkin Math Books. There are still a few of these being worked on but they will be printed and shared online when they are all complete. Since 1st Grade had just completed some work with the states of the United States in Social Studies they also played some online USA States games if they had completed their Pumpkin Math Books. 2ND GRADE: During Week 6, 2nd Grade worked on their Favorite Things About Autumn pictures in KidPix and reviewed the parts of the desktop using a PowerPoint presentation. They also used the program Jumpstart 2nd Grade. Internet Safety was the focus for 2nd Grade during Week 7. They were re-introduced to the characters at NetSmartzKids.org through the activities at Clicky’s Web World and were all awarded a Clicky’s Web World Certificate. Did this make it home for you to see? They all fondly remember NetSmartz and had fun playing some games on that site during the week. It was back to Autumn projects during Week 8 with the creation of Pumpkin Math Books. These will be shared online soon as will the Favorite Things About Autumn pictures. 3RD GRADE: All About Me pictures were the focus of Week 6 and 3rd Grade continued to work on these. They’re still not all done so be looking for these to come home during November when we have a chance to get back to them. Week 7 was Internet Safety Week for 3rd Grade. 3rd Grade participated in an interactive presentation from NetSmartz all about how to be safe on the Internet. Did you hear all about the WizzyWigs? After the presentation, 3rd grade played Internet Safety Games at NetSmartz Kids and continued to work on their All About Me pictures. Since 3rd Grade has been working on the Life Cycle of Plants in Science, they began a Life Cycle of Plants project in KidPix during Week 8. They are creating a title page illustration and four pictures to show the life cycle of a flowering plant. They will then create a slide show of their pictures which we will export and share here in a few weeks. 4TH GRADE: During Week 6, 4th Grade continued to work on their All About Me pictures. Most of these are done but a few are still not complete. They will be printed once they are all finished. Weeks 7 and 8 were focused on Internet Safety. 4th Grade watched a series of videos about Internet Safety and answered quizzes after each video. The wrap up to their Internet Safety unit will be a discussion of the quiz results and the creation of an Internet Safety Poster. These will be shared online when they are complete. 5TH GRADE: 5th Grade continued to work on their All About Me pictures during Week 6. Most of these are done but a few are still not complete. They will be printed once they are all finished. Internet Safety was the focus of Weeks 7 and 8. 5th Grade watched a series of videos about Internet Safety and answered quizzes after each video. The wrap up to their Internet Safety unit will be a discussion of the quiz results and the creation of an Internet Safety Poster. These will be shared online when they are complete. 6TH GRADE: Most of 6th Grade finished their All About Me bios in Word during Week 6. They also did their Daily Typing assignment on one of the days this week and wrote their reflections of September in Word. Week 7 and 8 were focused on Internet Safety. 6th Grade watched and discussed a video called Adina’s Deck which focuses on Cyber Bullying. They are currently working on creating comics using the drawing tools in Microsoft Word about Cyber Bullying. When these are completed they will be shared online. In addition, 6th Grade also completed their October reflections in Word and learned how to add them to the discussion section of their A Room With A View page. Make sure you visit the A Room With A View page each month as 6th Grade adds to this project throughout the year. NOTE: In order to be able to maintain the information on the wiki, all 6th graders must return a signed Wiki Warranty form. If you have not seen and signed this, please do so as soon as possible! 7TH GRADE: 7th Grade continued to work on their collaborative project, Human Genetics: A Worldwide Search for the Dominant Trait, during weeks 6-8. They were introduced to Google Docs and worked together in small teams to write portions of our introduction letter for the project. This will be online on the wiki once it is submitted to the project. They also completed a genetic trait survey of their class and each 7th grader surveyed either 6th or 8th grade for a specific trait. This data was all recorded in an Excel spreadsheet and the totals will be submitted to the Human Genetics project in the next week or so. During Week 7, 7th Grade watched a video called Adina’s Deck which focuses on Cyber Bullying. We will be discussing this video and creating a Cyber Bully Glog during November. 8TH GRADE: During Week 6, 8th Grade completed their Wiki Profiles to include information about what they hope to learn from working with the wiki this year. Week 7 and 8 were focused on Internet Safety. Like 6th & 7th Grades, 8th Grade also watched and discussed a video called Adina’s Deck which focuses on Cyber Bullying. 8th Grade has also begun creating Public Service Announcements about Cyber Bullying using PowerPoint and Animoto. These will be shared online when they are complete. 8th Grade also voted on their choice for the yearbook cover. Do you want a sneak peek at the cover?